Coconut appears to have been a standard ingredient in Anzac biscuits since the 1930s (see Sian Supski's report, page 8). If you do not like coconut or you wish to try the very early recipes, see the No coconut recipes in the next section. 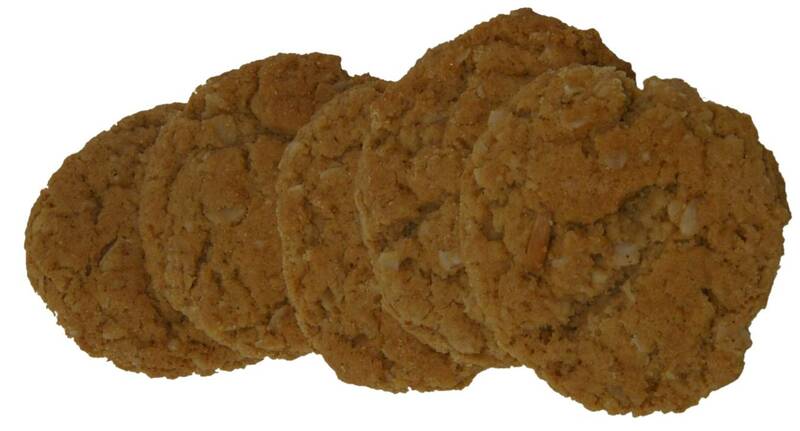 Origin and history of the Anzac biscuit, along with a recipe (includes coconut). Anzac biscuits coconut recipe from McKenzie's Foods. Two recipes are provided. The "Traditional biscuits" recipe includes coconut. From Sue Dyson and Roger McShane. Includes "an old grandmother's recipe" (using coconut) and a recipe that "makes 5 dozen" (also using coconut). "A traditional version without coconut." 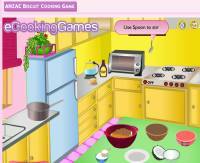 Two recipes are provided. "Our 'new' recipe" avoids coconut. From Sue Dyson and Roger McShane. Includes three recipes. The middle one (the first one under the heading "Anzac biscuit recipes") contains no coconut. Anzac biscuits that are claimed to be crispy on the outside, chewy on the inside. Scroll down to the bottom of the page. "This is my modification of the classic Anzac Biscuit recipe with much less saturated fat." The recipe writers replace some flour with wholemeal flour, reduce the quantities of brown sugar and coconut, and substitute oil for butter. "Our version has less sugar and significantly less total and saturated fat." The main kind of sugar that health-conscious people currently try to avoid is high-fructose corn syrup. Many people also try to avoid simple "fructose". And since the sucrose of table sugar contains fructose, many reduce the use of table sugar as well. Therefore, the ingredients of these Sugar-free Anzac biscuits usually contain no fructose but they MAY CONTAIN OTHER SUGARS. Uses granulated stevia and rice malt syrup. But uses butter. Uses olive oil instead of butter, and honey and vanilla instead of sugar and golden syrup. Uses dextrose and rice malt syrup. Suggests use of wholemeal plain flour. But uses butter. Uses glucose syrup and dextrose. Uses butter. 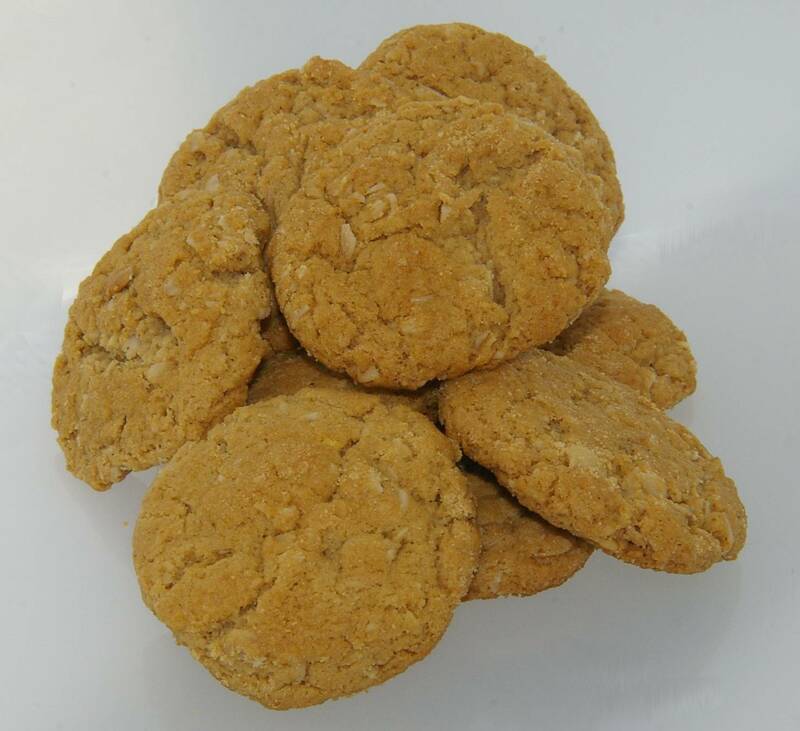 Recipe also called "Anzac Biscuits" or Rolled Oat Cookies. Uses gluten-free rolled oats, white and brown rice flour. Uses puffed rice and cornflakes. Uses gluten free rolled oats. As these biscuits, too, lack the characteristic oats, they should not be referred to as "Anzac biscuits". They basically use coconut instead of rolled oats. Wheat and additive free Anzac biscuit recipe. Uses Brighterlife Bendy Bread Mix. As they lack the characteristic oats, these biscuits should not be referred to as "Anzac biscuits". They basically use quinoa flakes plus brown rice flour, almond meal, buckwheat or tapioca flour instead of oats, and include vanilla bean powder and ground cinnamon. Use either rice malt syrup or maple syrup. "Dairy free, low GI, low sugar, wheat free." Uses wholemeal spelt flour, sunflower oil, rice syrup. Uses coconut oil instead of butter, and turbinado (raw) sugar and honey instead of white sugar and golden syrup. Uses coconut oil instead of butter, and agave nectar instead of sugar and golden syrup. Instead of butter, uses "oil" - presumably vegetable oil. Recipe uses olive oil instead of butter. Provided by an olive oil manufacturer. The author acknowledges the recipe source as being an advertisement form olive oil in a recipe magazine. Note that dipping Anzac biscuits in chocolate or making other modifications breaks with the "traditional" recipe. Referring to Anzac biscuits as Anzac "cookies" is frowned upon in Australia. For more information see the DVA's Protecting the word Anzac page. 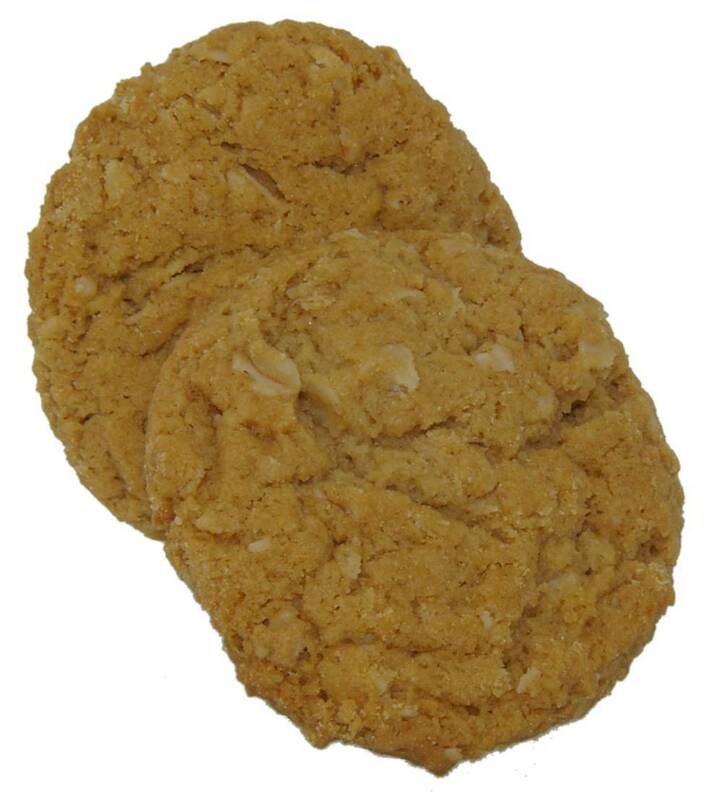 Anzac biscuits recipe with macadamia nuts and ginger. See "The future" for suggested variations, which include alternative recipes for Anzac biscuits and the use of Anzac biscuits to vary the ingredients of other recipes. Makes crisp biscuits. Additional note suggests modification to recipe to make chewy giant Anzac biscuits. A kind of Anzac biscuit muesli suitable as a breakfast food. Sugar-free, includes stevia powder, rice syrup, powdered ginger, almond meal, vanilla extract. Note that in Australia and New Zealand the word "Granola" is trademarked.